Yoga Accessories Ultra 4 Foot Circular Aerobics Mat. Yoga Accessories 4 ft. Circular Aerobics Mat allows you to exercise in any direction without having to step off the mat or reposition yourself. Perfect for reps, floor work, Pilates, and Tai Chi. Extra thick and comfortable on joints, this mat is durable and made of open-cell PVC. And Buy 1 Get 1 Free –YOGA Accessories Ultra 4 Foot Circular Aerobics Mat. 2 for $29.99 at YogaAccessories.com. YOGA Accessories Premium Printed 1/4 Inch Alignment Yoga Mat. A great choice to provide to students taking beginner yoga classes, or to offer aspiring yoga teachers currently in training, the 1/4" thick Printed Alignment Yoga Mat is the best tool to help Yogis perfect their postures. This special mat has a series of strategically placed horizontal, vertical, and diagonal lines used as guides for the hands and feet, allowing Yogis to get the most out of each posture. And Buy 1 Get 1 Free – YOGA Accessories Premium Printed 1/4 Inch Alignment Yoga Mat. 2 for $18.99 at YogaAccessories.com. BOGO Oversized Nylon Drawstring Yoga Mat Bag. Buy 1 Get 1 Free – Swim Water Belt. Buy 1 Get 1 Free – Nylon Zippered Yoga Mat Bag. Buy 1 Get 1 Free – 2'' Foam Yoga Brick. Buy 1 Get 1 Free – 1'' Foam Yoga Brick. Buy 1 Get 1 Free – 10' Cinch Buckle Cotton Yoga Strap. Buy 1 Get 1 Free – 6' Cinch Buckle Cotton Yoga Strap. 6' Cinch Buckle Cotton Yoga Strap. Our cotton yoga straps are useful for yogis of all levels. One reason people stay away from starting yoga is they believe they are not flexible enough. What they don't realize is that yoga is not about flexibility, but about strengthening the body to join with the mind and spirit. Yoga straps help achieve this goal by making a pose attainable from the onset until flexibility is achieved. Belts provide length, enabling you to grasp limbs that are otherwise too far away. And Buy 1 Get 1 Free – 6' Cinch Buckle Cotton Yoga Strap. 2 For $5.99 at YogaAccessories.com. Buy1 Get 1 Free - Organic Cotton Yoga Mat!! 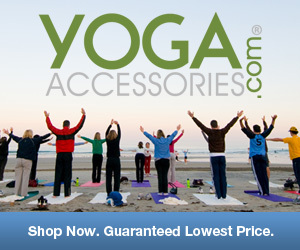 At YogaAccessories.com we understand that nothing that we sell can provide true happiness. But we are dedicated to providing you with the best yoga, meditation, spiritual, wellness and holistic living supplies to support your well being and enrichment. We have been selling high quality yoga accessories over the internet since 1997.